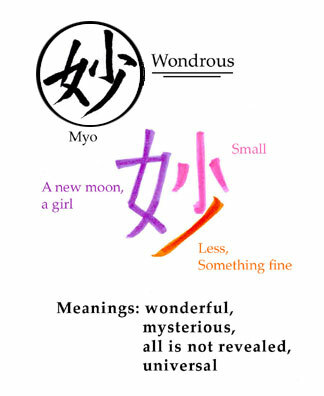 The word that is pronounced Myo by Nichiren Buddhists is composed of two Chinese root characters (for a better view, see page 2, upper right hand corner of the Japanese Gongyo book). The character to the right is Shao. The character to the left is Nu. Nu by itself means "young girl," "thou," or "you." Shao is something small that has been cut in half — something fine, something difficult to perceive. Kumarajiva used these symbols to express "wonderful," "excellent," "subtle," "fine," and "mysterious." Click here for a full-size printable version of the explanation of Myo (at left).